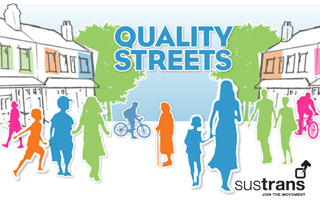 Slower streets are quality streets and better for public health say Sustrans. A new campaign by the charity for smarter travel choices is calling on people to to demand that their local authority take action to produce residential areas where people feel safe to walk, cycle and socialise - so called 'Quality Steets'. Sustrans say a key element of this is a 20 mph speed limit and is asking people to lobby their local councillor between now and the end of February for slower speeds. In the streets where such changes have happened residents now feel much safer, with their fear of traffic greatly reduced. Half of residents agree that traffic speeds have been reduced and 36% now say they’d be happy to let their children play outdoors (compared with just 9% before the changes were made). What do you think about lower speed limits? Let us know.